Small Business owners are constantly faced with the task of learning and adapting to problems that they come across. Starting a small business is no easy task and continuting to grow within the business world is just as difficult. A college education is something most small business owners do have, although there are a lot of successful businesses that have been started by brilliant people with no college degree, like Bill Gates who started Microsoft and Steve Jobs who started Apple, both of whom dropped out of college. A Masters of Business Administration, also known as a MBA, is a degree many small business owners go for to further their understanding of the business world and ideally increase their revenue stream with new knowledge. Knowledge is something all small business owners have, well-educated or not. There are some who are geniuses and rely on their creativity and ideas to create successful businesses. These members of the business world are very rare and most small business owners do go to school, on some level, for an education in the business world. Entrepreneurs often read books, in addition to their curriculum school, and outside of it, to boost their creativity and their understanding of what is needed to exceed in the business world. The ability to find innovative ways to look at problems your business faces on hourly, daily, weekly and monthly bases is a quality all small busienss owners have that can help them to take their business to the next level. Adapting to the business’ landscape your business exists in and finding new ways to approach challenges is essentail for the role of each and every small business owner. There are hundreds, if not thousands of essential books within the business world that can teach you everything from how to start a business, including how to write a business plan and to how to understand your particular industry better. Blogs have also become more commonplance to give advice to small business owners. 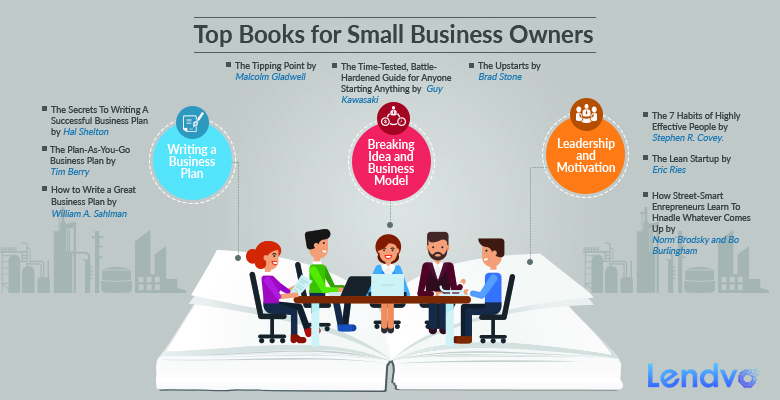 So, whether you are starting your business from scratch, learning how to motivate your employees better, market your services or raise new capital, we have created an inclusive list of books in the industry and broken them down into categories in different levels of owning a small business. Creating a business plan is an essential step in creating a business. This is something all businesses need to layout their ideas, raise capital, layout a five-year plan and address the industry that their business will be delving into and break down the best system your business should use to succeed in the given industry. This book is a guide that takes you by all the steps of what it takes to create a successful and award winning business plan that will pave your way to success. Mr. Shelton, an expert in the small business landscape, lays out the rules for what it takes to create a successful business plan that can increasingly make your business more successful by showing you which style of businss plan is needed for your business based on the fact of whether you are starting a nonprofit or for-profit business. There is also a focus on entrepreneurs finding mentors and people who are in their corner to provide them with advice. Mr. Shelton also breaks down how to acquire finding and the stages the small business goes through offering invaluable advice with examples of actual small businesses that have created small businesses and goen to succeed. Tim Berry is mostly known as the founder of the world-renowned company, Palo Alto Software. This is the bestselling business software in the world so there is reason to follow Mr. Berry’s advice. This book Tim Berry wrote about writing a business plan is a step-by-step guide that provides business owners with punctual and easy to understand advice on what it takes to create a business plan that will give you the essential outline needing to create a business model that you can continue to grow way beyond the first give years, which is the amount of time in which a business usually fails. The book offers guidance for all stages of any business. He focuses on what it takes to create an out of the ordinary business plan in the minimal amount of time by laying out clear-cut instructions of what it takes to take full ownership of your business, raise money, increase profitability and operate on a daily basis. Mr. Berry also provides real-life examples highlighting what increases success. William A. Sahlman’s book on writing a successful business plan has become one used regularly by the Harvard Business Review, has been revered as a bible for business owners creating a business plan. The book focuses on the step-by-step process of the hurdels faced in creating a small business plan while also laying out the riveting ideas that are continuously being creating to achieve the highest level of success by the most innovative business owners out there. Sahlman focuses on what it takes to create a successful small business by focusing on what is essential to create ia successful small business plan that will appeal to investors and avoiding the common mistakes entrepreneurs commonly do not which may lead them to failure like only focusing on financial projections. He delves into the essentail factors in creating a new busines like the people creating the busiess and the services they provide, the industry their business is delving into and how they will respond when faced with problems entrepreneurs regularly face. Comping up with the idea for your business is the first thing you will need to do before writing your business plan. After all, no business plan can be created without their being an idea for the business in the first place. It is important to take a look around at the culture you are living int o conceptualize what business idea will fit in to create a niche within your culture. Here we take a look at a couple of the top books by successful entrepreneurs and groundbreaking thinkers in our culture that have helped countless numbers of entrepreneurs pave their way to success. Malcolm Gladwell is respected for his intuitive outlook on the business world. This bestelling book is one recommended by many businessmen, business owners and creative thinkers. The book focuses on the tagline it offers on its cover: How Little Things Can Make a Big Difference. Mr. Gladwell offers a number of examples about ideas that come up based on social behavior and norms that create epidemics. He draws on the cultural activity within society occuring at a particular time and how ideas within this activity can create a windstorm behind them leading to a successful business, which is indeed what he refers to as the tipping point phenomenon. It largely focuses on fads in society and how an item can be created out of this fad to sometimes yield the lucky few entrepreneurs a lot of money in the future. The eseential argument Gladwell makes, which he explains through examples, is that ideas can spread just like epidemics, or fads, and those who capitalize on this will succeed. The trick when reading this book is to evaluate the cultural surroundings that exist around us today and think creatively about ideas that may come from our culture to define it in a year, two, three, five or even in a decade. Guy Kawasaki is known by most as an Apple employee. His book focuses on inspiration and desire. He delves into his belief system that as long as there is a will to create and succed, there will be a way to create a successful business that will thrive, as its employees will thrive because of the inspiration behind the business owner. He goes onto discuss how the idea behind the will is something that you have inside you that wants to make the world a better place with your idea, which may be the next big thing. Making this idea a reality is what he focuses on by delving into what it takes to create yourself as a personal brand and focus on all the right things to do so. Additonally, Kawasaki focuses on what it takes to hire the right people to help you build your brand and beat the rest of your industry. His first business was Garage Technology Ventures, a venture capital firm, where he was responsible for testing ideas by numerous start-ups. He has written several other bestselling business articles and books which have helped lead to the success of countless small business owners. The upstarts is a book that came out in the in the past few years that addresses what it takes to succeed as a small business in the ever-changing modern era. He focuses mostly on Silicon Vallery businesses, especially Uber and AirBnB an dhow they have taken on the opportunity to conquer neighborhoods, travel and what it takes to conquer an entire industry by finding a niche market and developing a concept to actually change this market in true Silicon Valley fashion. Stone focuses on what successful entrepreneurs, people with great ideas who make them a reality, do to succeed including understanding their market to find the right point of entrey and focusing on what it takes to capitalize where their opportunity lies. This is an important book to read for any aspiring entrepreneur in the technology atmosphere as it continues to lead the way for the forefront of growth in the business atmosphere. Additionally, even entrepreneurs not aspiring to create businesses in the technology field should read this book, because it does focus mainly on ideas and what it takes to think to be the next successful entrepreneur. Being a good leader will require fortitude, humility and confidence. It is hard to possess all of these qualities and allow them to work seamlessly. All leaders face some of the same challenges, while many difference, when beginning and running a small busienss. It is important to understand what small business owners have done in the past to be successful to allow yourself to better understand how to motivate your employees and set the best example for your company. Here are a few great books on what it takes to be a successful leader. Stephen R. Covey’s book about the 7 habits of highly effective people is highly regarded by business leaders, owners, entrepreneurs and blogs that rate these owners throughout society. Covey takes a principle-based approach on what it takes to use your personal qualities and problems to make them your professional successes. Within the book, the innovativeness Covey offers when looking upon the business landscape in conjunction with yourself is a masterpiece that provokes business owners to be loyal to themselves, their employees and their customer. The step-by-step guide provided has sold millions of copies that have offered business owners and leaders around the world, like Maya Angelou, to achieve success and become more successful because o f the values cited in the book and the best ways to use them in your business cycle. Dr. Covery’s book is also highly regarder on its focus of altruistic techniques needed to help your business succeed which is something we need more than ever in the ever-changing business landscape we exist in today. This is a book recommended for all entrepreneurs, no matter the industry you delve into or are in, because it is still revered by top universities and entrepreneurs after 25 years. Eroc Ries’s timely book is a timely look at the reasons why most start-ups do in fact, fail and how to not make the mistakes that failing start-ups make. This book serves as a unique approach to building a startup and changing the approach small business owners take to build new products and new businesses. Eric Ries identifies startups as those that are found in a college dorm room with one business owner or founded by a group of professionals. Regardless, companies of all different sized and from all different backgrounds, face similar changes. He focuses on scientific experimentation and the focus of lessened development because of the faster era we live in, being used to create more successful businesses in. He argues that dreary business plans are becoming outdated while entrepreneurs are testing their ideas in real-time more often than not. The book largely focuses on the fact that new startups and products often fail, but that the great companies focus on five principles to succeed being: entrepreneurs are everywhere; entrepreneurship is management; validated learning; build-measure-learn; and innovation accointing. Successful startups are often able to raise money and this book will guide you to what these successful businesses have done to not have to take out loans although for some small businesses, that is the best route. These columnists for Inc. magazine came up with an excellent book for budding entrepreneurs which focuses on the thought processes needed to face the challenges entrepreneurs face today. Further, they go on to address the different challenges small business owners face and how they capitzlize on these opportunities based on the expereince they have had. Whether you are embarking on a new venture or have already started a business that you are trying to make better, you will learn from the knowledge these columnists provide in this book. They focus largely on the personal traits of entrepreneurs and what it takes for them to get into the businessworld and furthermore, succeed. The Knack focuses additionally on difficult issues that an entrepereneur faces, like raising capital and focuses on what will help keep the small business owner afloat once they do so by providing insight on tracking expenses and other details a small business owner must pay attention to on a weekly basis. They offer a step-by-step appraoch that helps the reader achieve their goals including what it takes to be consistently resilient to overcome the challenges you will face as an entrepreneur. This is a uinque look at what it takes to be a street-smart entrepreneur to handle the challenges they come across from beginning to end of the journey that is running a small bnusiness.